Tuesday August 6th 1889 We took the carpet up in the south east room and washed it before dinner and in the afternoon cleaned the other east room. Will went to the valley to invite the folks to my quilting party next Saturday. After we came back he toojk me over town in the buggy. We were out to Fannys to see the folks. I got the supper and done up the work while Mother went to town. Wednesday August 7th 1889 Mother and I sewed the carpet for the southeast room and I got it down before dinner. She went to town in the afternoon to see John and Hatt start to Burlington. Will helped me clean the northwest room. Edith came home with Mother to stay awhile. Thursday August 8th 1889 I worked very hard today. cleaned both halls and stairs and the little room at the head of the stairs. Will helped me some about it. I was very tired tonight. The weather has been cool and fine for house cleaning. 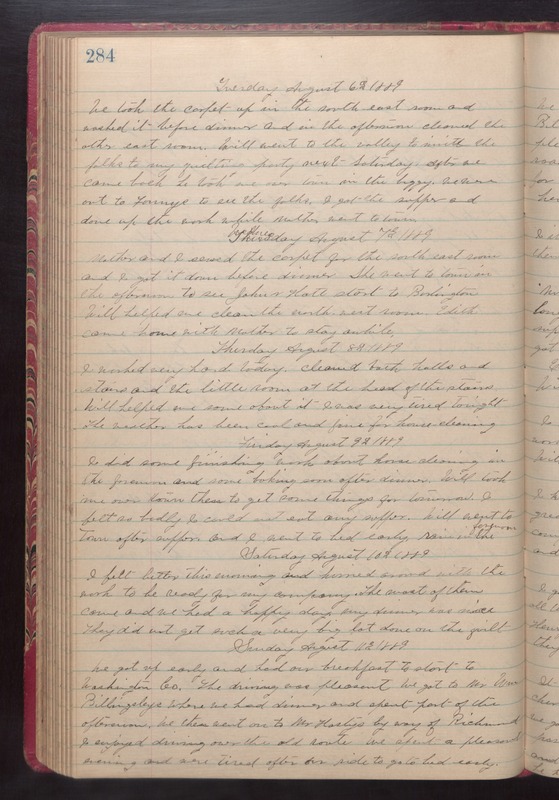 Friday August 9th 1889 I did some finishing work about house cleaning in the forenoon and some baking soon after dinner. Will took me over town then to get some things for tomorrow. I felt so badly I could not eat any supper. Will went to town after supper and I went to bed early. Rain in the forenoon. Saturday August 10th 1889 I felt better this morning and hurried around with the work to be ready for my company. The most of them come and we had a happy day. My dinner was nice. They did not get such a big lot done on the quilt. Sunday August 11th 1889 We got up early and had our breakfast to start to Washington Co. The driving was plesant. We got to Mr. Wm Billingsleys where we had dinner and spent part of the afternoon. We then went on to Mr Hasty's by way of Richmond. I enjoyed driving over the old route. We spent a pleasant evening and were tired after our ride to go to bed early.